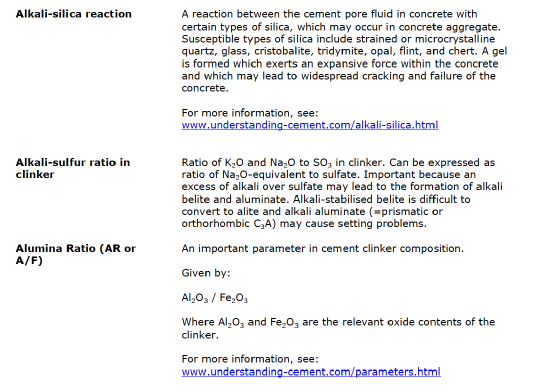 The internet may be the best source of information ever, but if like me you still seem to spend a lot of time looking for cement facts, formulae and other stuff, the "Understanding Cement" glossary might be just what you need. The new edition contains many more definitions of words or phrases relating to cement science than the original version; many of these new words were proposed by people who downloaded the first version and who kindly suggested new words. Example of part of one of the glossary pages. To get your free cement glossary in pdf format, plus petrographic microscope and SEM images you might like to use as desktop or screensaver images, plus our new ebook: "Low Concrete Strength? Ten Potential Cement-related Causes" all you need to do is to subscribe to CEMBYTES, our monthly newsletter. Just sign up below and confirm your subscription and you will see a link to the special Newsletter Subscriber page, from where you can download the ebook, images and glossary. I promise to use it only to send you "Understanding Cement" Newsletter. You can unsubscribe any time you want, by clicking on the "unsubscribe" link in the Newsletter.